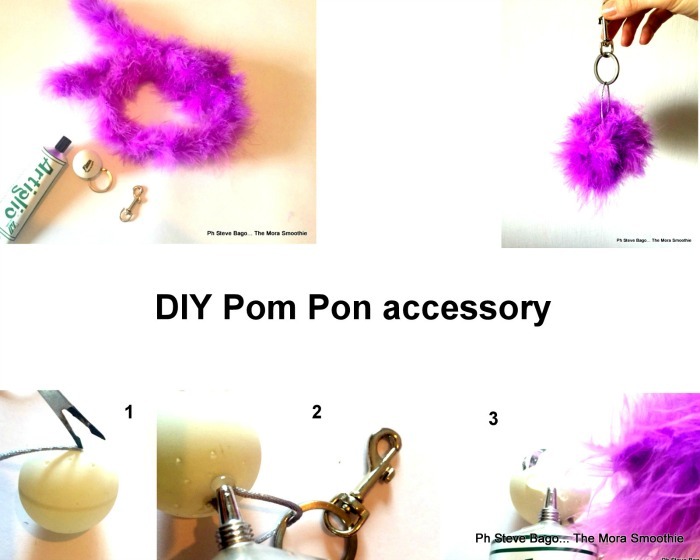 The Mora Smoothie fashion blog, DIY fashion by Paola Buonacara: Fashion DIY pom pon accessorie! Fashion DIY pom pon accessorie! Hi guys out there, are you ready for the weekend? Meanwhile I leave you this tutorial about a fashion DIY that to create it, you really need just few minutes, but the effect will be super trendy. Buongiorno a tutti, siete pronti per il week-end? Intanto io vi lascio il tutorial per un fashion DIY che a crearlo ci impiegherete veramente pochissimo tempo, ma l'effetto sarà super trendy. You have to pierce the ball and insert the thread in which you will have passed the carabiner and stop with a little bit of glue. Then start to sprinkle with a little bit of glue the ball and applied the feather boa up to roll it over the surface, after drying your furry pom pon will be ready to be worn, what do you think about? Bisogna bucare la pallina ed inserirvi il filo in cui avrete fatto passare il gancio per le chiavi e bloccate un po' di colla. Poi iniziate a cospargere con un po' di colla la pallina ed applicate il boa sino ad arrotolarlo su tutta la superficie, dopo l'asciugatura il vostro pom pon peloso sarà pronto per essere indossato, che ve ne pare? This is so cute. I am thinking of making one for my daughter now. Thanks for the idea. Milano Fashion Week! UMA WANG Fashion Show! Milano Fashion Week! My first outfit. L'Oréal casting crème gloss #zeroscuse ! The '70s and the '80s in my outfit! Is it S.Valentine coming soon?